Year-over-year property appreciation rates by state. Rhode Island is in the 7% to 13% range. 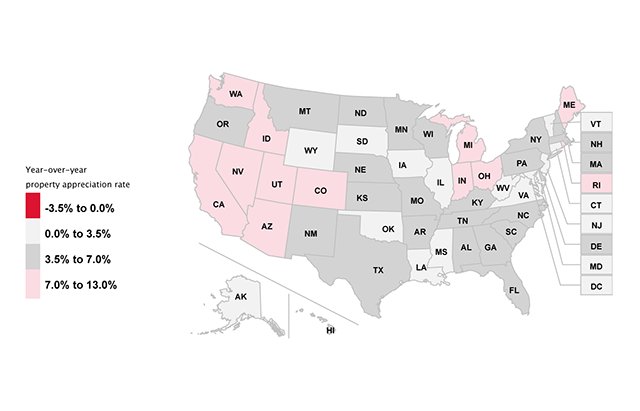 This map illustrates the top states for property appreciation rates year over year. Property appreciation is calculated based on repeat sales of the same properties, which can avoid the problem of trying to account for price differences in homes with varying characteristics. 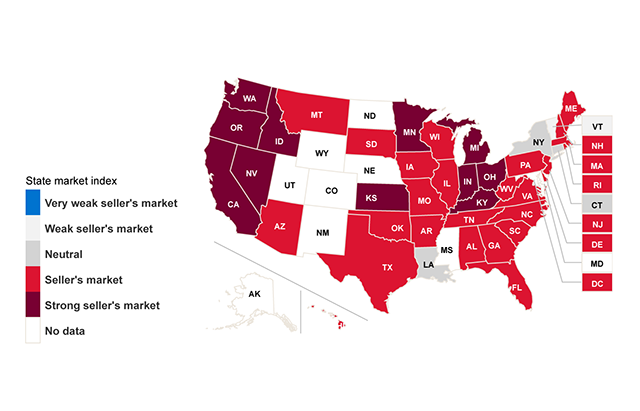 All states saw property appreciation in comparison to a year ago. $260,000 SOLD by The Adams Team at Sankey Real Estate ~ 46 Poisson St Cumberland RI 02864. Our hard work is SO worthwhile when we receive amazing reviews like this one! THANK YOU! Thank you for another wonderful 5 Star Review!! Revamping our team, software, systems, and marketing! Get ready for our team to pump new life into the MA and RI real estate markets! 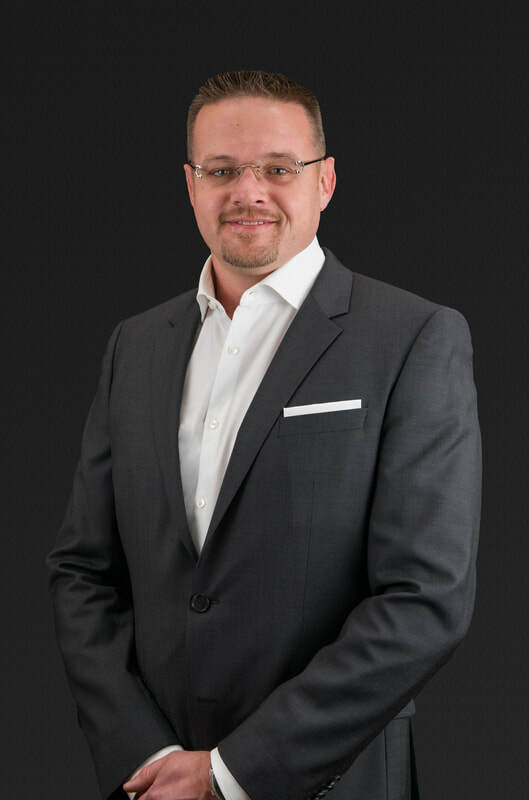 ​Exciting things are happening at Sankey Real Estate. As we gear up for a busy Spring season we are bringing on a new team structure, more marketing, better software and systems and we are looking to step up our volume in North Attleboro, Mansfield and all surrounding areas including Rhode Island. 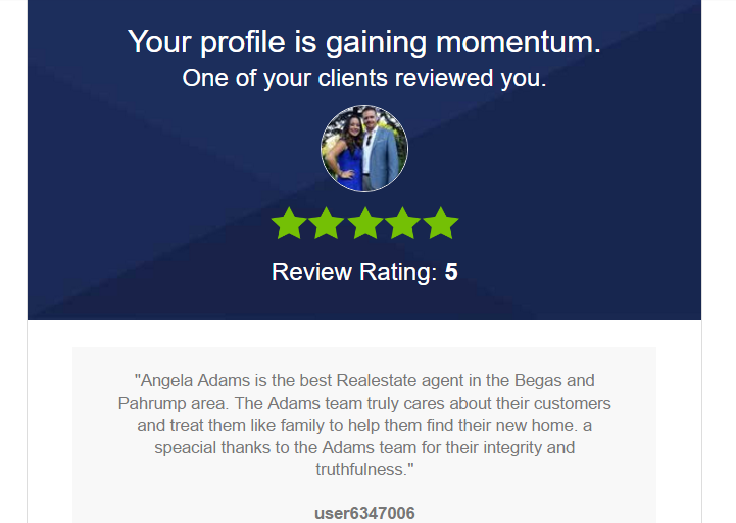 We want to thank our past clients for their continued support as well as thank you in advance for any friend or family referrals you have that we may be able to assist. We hope you are all having a wonderful first quater of 2017! Let's make the rest of the year outstanding!! If you are looking to buy a home in MA or RI please fill out our BUYER'S FORM HERE. If you are looking to sell a home in MA or RI please fill out our SELLER'S FORM HERE. 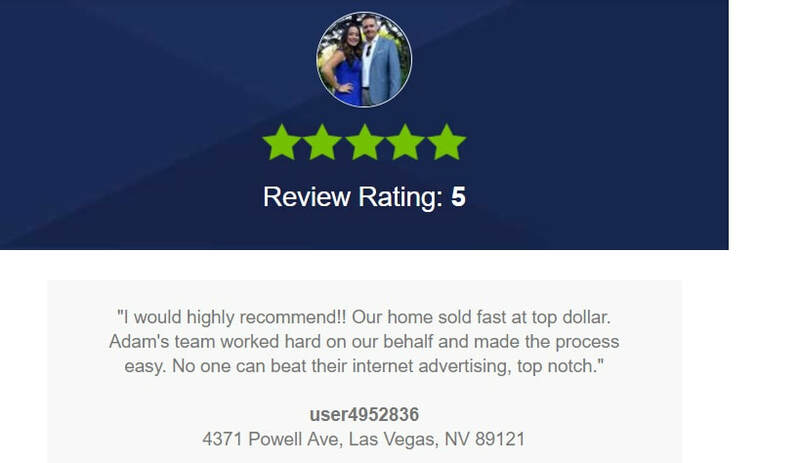 Another Happy Buyer wrote a wonderful 5 star review for us! Thank you! 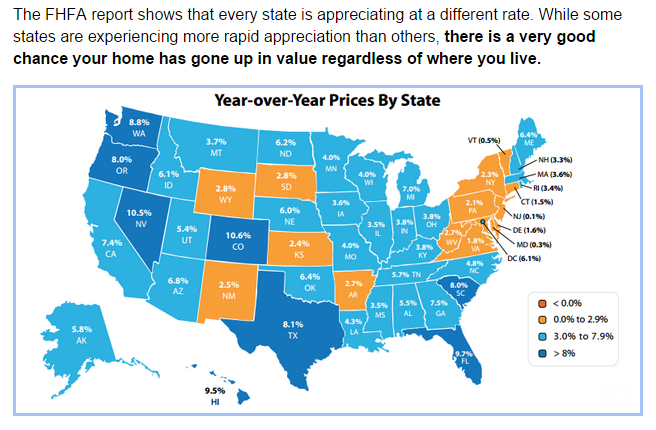 Rhode Island Year over Year Price Appreciation Map compared to the rest of the country. 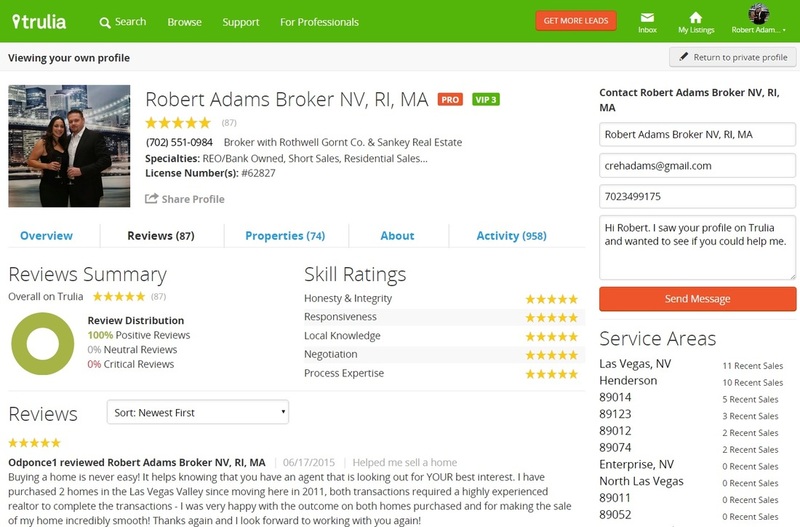 Our Latest Review on Trulia. Thank you to our valued clients for taking time to write such wonderful comments about us. 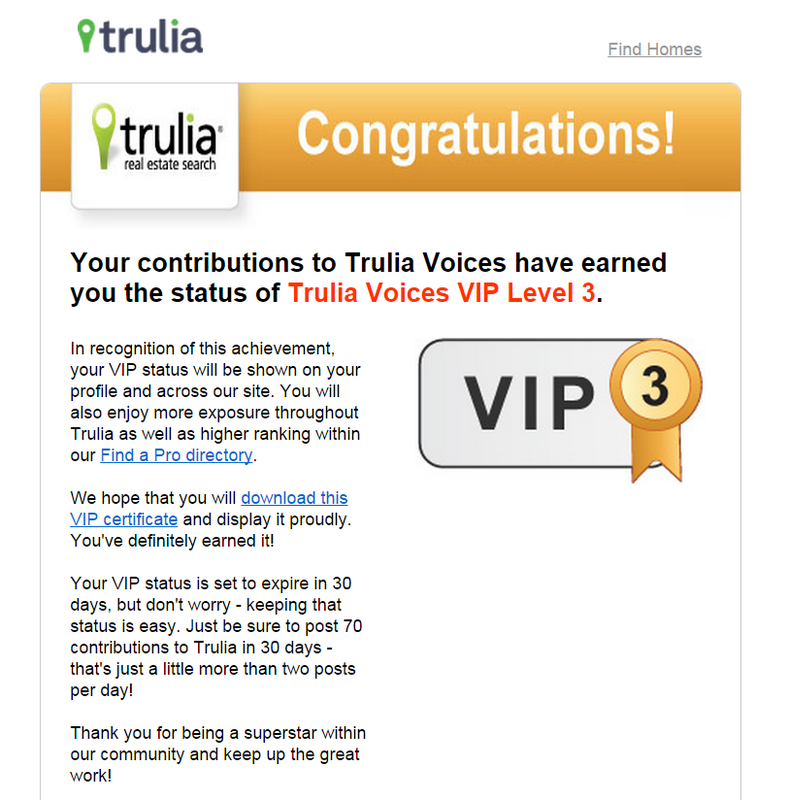 Trulia Voices VIP Level 3. Conventional loans now offering 3% Down Payment programs. "Last week I shared that this was coming but that no announcement had been made. Well here it is, officially announced on Monday, 12/08/2014 and effectively online over the weekend of 12/13/2014;Fannie Mae will offer 97% LTV financing to help home buyers who would otherwise qualify for a mortgage but may not have the resources for a larger down payment. I read the FannieMae press release and the official Selling Guide Announcement SEL-2014-15 to see if either was signed by Santa Claus, but they were not. First time homebuyers can now in fact put as little as 3% down and get conventional financing (no longer confined to the FHA only box). There are no prohibitive restrictions; in fact if two people are buying a home, only one of them need be a first time buyer. Standard FannieMae underwriting guidelines and standard PMI coverage and costs apply. This is a significant mortgage financing event and should bring more first time buyers into the active home buyers’ pool. I would expect to see mortgage and real estate people waiving the 3% down payment banner in all of the parades and in all of the advertising media in the months to come. Up until now, the limited-down-payment-first-time-home-buyer market was sorely underserved primarily with HUD insured FHA financing as the primary option. As FHA mortgage insurance (MIP) costs have risen to dizzying heights in the last few years, consumers in this market segment stepped back to assemble more down payment and qualifying virtues to secure conventional financing. Expensive FHA upfront and monthly mortgage insurance made the economics of low down payment mortgage financing prohibitive. Enter 3% down payment conventional mortgage financing and the landscape changes dramatically. Conventional financing does not handcuff borrowers to mortgage insurance forever like FHA MIP does. Once equity targets (20% – 22%) are reached, current appraisal supported value can eliminate conventional PMI (Private Mortgage Insurance). Not so with that FHA MIP, once you get it, the only way to get rid of it is to refinance out of the FHA loan or sell the house! And let us not forget about that upfront FHA MIP insurance which is 1.75% of the loan amount added to the loan. So a $200,000 FHA loan would actually start at $203,500 ($3,500 for the upfront MIP). I did not make that up, go look it up for yourself! By the way, conventional PMI (Private Mortgage Insurance) has no upfront PMI, never has. If you were a first time homebuyer with a limited amount of money for a down payment, which would you choose? I gotta’ think that the justification model for that ever increasing FHA MIP is getting a hard second look over at HUD. Or at least I certainly hope that it is, otherwise these new FannieMae enhancements will further erode already reduced FHA loan volume. With the MMI (Mutual Mortgage Insurance) Fund already running an unsustainable deficit, reduced FHA volume and the reduction in the attendant MIP will visit the kind of financial crisis upon HUD that may necessitate a dreaded bailout. Historically, Commissioner Galante and her team respond with increasing FHA MIP to solve the MMI Fund deficit management issue. Not sure if that will help this time because all of those potential MIP contributors will be over at FannieMae making payments on their 3% down conventional loans." If you want to see what you loan programs you qualify for please contact me directly and I can put you in contact with our lenders. They can run your entire financial scenario and explain all of your financing options. This is a free, no obligation service.